Does More Spending Help Education? What is the Cost of a Great School? What does it cost to provide a terrific education? It certainly is possible to spend a huge amount of money. But what is a reasonable baseline? A Primer for Making Cost Adjustments in Education, National Center for Education Statistics, U.S. Department of Education. For a variety of reasons, the cost to provide a school program in one area can be different from the cost of the same program in another area. But how much different? This page is an overview that raises various issues, and describes approaches that have been used. At the very bottom of the page are links and info on getting a more complete report. There is little evidence that increasing spending, on its own, does very much to help schools. More Spending Is Not Answer by Rod Paige, U.S. Secretary of Education, USA Today, January 10, 2003 "What determines a child's future isn't how much is spent, but how wisely that money is spent. If there is no accountability, or schools use unproven fads for instruction, it doesn't matter how much money is thrown at a problem; it will be wasted." Spending Increases Don't Improve Student Achievement: Report by Lori Drummer, School Reform News, May 1, 2006. "Dollars Don't Yield Success:	As has been the case with previous editions, this version of the Report Card found no evident correlation between improved student achievement and increasing education spending or lowering student-teacher ratios." Excerpts from Stupid in America: How We Cheat Our Kids, ABC News, January 13, 2006. "While many people say, 'We need to spend more money on our schools,' there actually isn't a link between spending and student achievement. ... Jay Greene, author of Education Myths, points out that 'If money were the solution, the problem would already be solved ... We've doubled per pupil spending, adjusting for inflation, over the last 30 years, and yet schools aren't better.' ... Ben Chavis is a former public school principal who now runs an alternative charter school in Oakland, Calif., that spends thousands of dollars less per student than the surrounding public schools. He laughs at the public schools' complaints about money. 'That is the biggest lie in America. They waste money,' he said." Myth: Schools Don't Have Enough Money By John Stossel, January 18, 2006. "Not enough money for education? It's a myth. The truth is, public schools are rolling in money. If you divide the U.S. Department of Education's figure for total spending on K-12 education by the department's count of K-12 students, it works out to about $10,000 per student. Think about that! For a class of 25 kids, that's $250,000 per classroom. This doesn't include capital costs. Couldn't you do much better than government schools with $250,000? You could hire several good teachers; I doubt you'd hire many bureaucrats. Government schools, like most monopolies, squander money. America spends more on schooling than the vast majority of countries that outscore us on the international tests. But the bureaucrats still blame school failure on lack of funds, and demand more money." A Smart ALEC by David W. Kirkpatrick. "...per-pupil spending in constant dollars has increased significantly over recent decades. ... [A report] notes 'We cannot simply spend our way to better grades, but must make sure that we are making the right kinds of investments in our schools to promote high student achievement.'" Remedial Education by Clint Bolick, Wall Street Journal, July 12, 2006. "A world of education reform will change tomorrow when a group of families files a class action lawsuit in Chancery Court in Newark, N.J. They are asking for an immediate and meaningful remedy for 60,000 children trapped in failing schools -- by transferring control over education funds from bureaucrats to parents. ... One of the defendant school districts in the new suit, Englewood City, spends $19,194 per student, well over twice the national average. But at Dismus Middle School, over two-thirds of the students do not have basic proficiency in math and fewer than half are proficient in language arts literacy. Newark, a recipient of massive Abbott funding, spends $16,351 per student and pays its teachers an average salary of $76,213. Yet in 24 of its schools, fewer than half the students demonstrate basic proficiency in math or language arts. At William H. Brown Academy and at Dr. Martin Luther King, Jr. School, fewer than one of every 10 students demonstrates basic math proficiency. It's time to try something else for these children." Texas Ruling Paves Way for Education Reform by Neal McCluskey, January 3, 2006. "A few weeks ago, the Texas Supreme Court declared that educational 'adequacy' is not synonymous with 'more money.' ... According to the majority, 'While the end-product of public education is related to the resources available for its use ... more money does not guarantee better schools or more educated students.' The Court also accurately says that, 'structural changes, and not merely increased funding, are needed in the public education system.' ... Yet despite the wisdom of the majority, it was still the minority -- lone dissenting justice Scott A. Brister -- who cut to the chase. Brister noted that all the plaintiffs in the case were school districts, not parents, thus disqualifying the suit because the state constitution's 'education guarantee is a right that belongs to school children rather than school districts.' The point was especially important because special interest groups entrenched in districts -- administrators, teacher unions, etc. -- are too often concerned with their desires, and block what Brister believes is essential to make education work: competition. 'Even formerly communist countries recognize how efficiency is produced,' he observed, 'not by higher taxes, and not be state control, but by freedom for competition.'" A Sign of the Times by Thomas Sowell, May 16, 2003. "They say a picture is worth a thousand words. That was certainly true of a recent photo of a little 7-year-old boy holding a sign demanding more money for the schools and holding his fist in the air. ... The little boy with the sign and his fist raised in the air is just one of the millions of victims of a shameless education establishment. It is not just that he is not in class learning the things he will need for his own mental development. He is out in the streets learning dangerous lessons for the future. "The most dangerous lesson of all is that he doesn't need to know what he is talking about, that what matters is venting his feelings and being an activist. ... Far too many public schools have far too many other agendas than providing children with intellectual skills. Political propaganda is just one. Using the children as guinea pigs for fashionable notions is another. And, at the top of the agenda is protecting the jobs of teachers, even those who are grossly incompetent." "If you give the Board of Education more money, you end up with something like the old Soviet Union." Half of public school employees are not teachers! School Pay and Staffing Statistics, Education Intelligence Agency, April 19, 2005. Teachers comprise no more than 50.8 percent of all K-12 public education employees in the United States, according to this EIA report. Eighteen states plus the District of Columbia employ more non-teachers than teachers. The finding is just one of the tables included in the school pay and staffing statistics report, updated every three years by EIA using the latest information from the U.S. Census Bureau, U.S. Department of Education, and National Education Association. The report also contains tables ranking the top and bottom 25 large school districts in per-pupil spending, state per-pupil spending, average teacher salaries, teacher compensation as a percentage of instructional spending, number of teachers for every district administrator, teacher salary vs. worker salary, cents spent on benefits for every dollar of salary, average teacher compensation, and per-teacher spending. Paying Private Prep School Prices for Public Schools "[In Virginia,] sixteen school districts spent over $10,000 per student -- a cost rivaling tuition at elite private prep schools. ... One school division spends more per public school student ($14,475) than Governor Warner pays in private school tuition for his children to attend Burgundy Farm Country Day School ($14,225). " Schooling's Fiscal Crisis: "It's Deja Vu All Over Again" by David W. Kirkpatrick. "The news is full of stories about an urgent and growing fiscal crisis in the state budgets in general and the funding of public schools in particular. ... [One educator] said, '...somebody's got to figure out how we can to it better.' ... Somebody has, but the status quo forces continue to prevail. What [does the establishment] propose to do to meet this crisis? It's clear what they are against -- virtually every reform that has been proposed for at least 30 years. What are they for?" Businesses Not Feeling So Charitable Toward Schools by Del Jones, USA Today, September 17, 2002. "Many businesses and corporate foundations say they have grown so frustrated with the pace of public education reform that they are ready to cut back on contributions to public schools." Schooling's Fiscal Crisis by David W. Kirkpatrick, September 4, 2003. "Public schooling is said to face a financial crisis. ... Among the factors involved, two stand out. First, like many private corporations that have failed, school districts seem incapable or unwilling to change the way things are done despite the severity of their problems. Second, they blame everyone for their problems but themselves, and these excuses are reported as if they are sufficient explanations." Fiscal Indiscipline: Why School Districts Can't Downsize, Education Next, Winter 2004. "A movement to decentralize budgeting decisions to the school level has taken hold in a number of districts including Edmonton, Houston, and Seattle. Coupled with school choice, decentralization promises to encourage innovation while reducing the need for large, expensive central-office staffs. Here too, however, even reform-minded districts find it difficult to furlough employees or to redistribute resources. In the following [articles], political scientist Jon Fullerton and business professor William Ouchi discuss the political and organizational obstacles school districts face in trying to manage their finances and promote efficiency." Broken Bonds: Big Money, Unspoken Practices -- The Costly World of School Loans : links to a series of reports on school bond issues run by the Daily Herald in February 2006. "A typical home loan will cost you twice what you borrowed when it's paid off with interest. Governments can get better deals. ... Yet not all governments avail themselves of lower cost loans -- at greater cost to taxpayers. A Daily Herald analysis of 206 suburban school district loans reveals many taxpayers repay those loans at rates higher than they would on their homes." The Six Habits of Fiscally Responsible Public School Districts (PDF doc) by Kirk A. Johnson Ph.D. and Elizabeth Moser, December 3, 2002. A new law adopted by the Illinois legislature in October 2007 gives school districts a whole new avenue for raising even more money, namely, local sales taxes. To do this, school districts accounting for at least 51% of the enrollment in a county can ask their county board to place a referendum on the ballot for a new sales tax. Sales tax money raised this way would only be available for capital expenditures. Weirdly, all districts would benefit if such a referendum passes -- a district cannot opt out and not take the cash. This new scheme is available to all districts in all counties, with the single exception of Cook County. The amount of money that the federal government spends on education has skyrocketed, particularly since the passage of No Child Left Behind. Even just looking at K-12 alone, USDOE spending is budgeted at $36,276,140,000 for 2007, a leap of an astonishing 67% since the $21,693,965,000 for 2000. That and other details on spending trends by the federal government can be found in these Budget History Tables on the website of the U. S. Department of Education. A Lesson in Waste: Where Does All the Federal Education Money Go? by Neal McCluskey, Cato Institute, July 7, 2004. Also see full text of this policy analysis (PDF). U.S. Department of Education tables by state for 2001-2008. 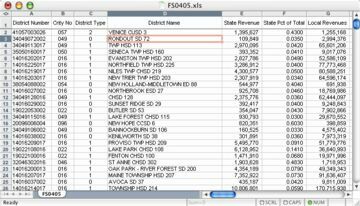 This site has current links for tables by state and by program, in both Excel and PDF formats. 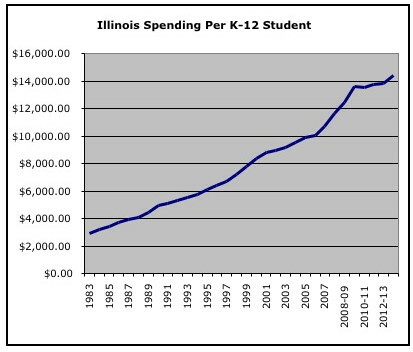 Illinois received $959,207,185 from the USDOE back in 2001. This windfall exploded to $1,472,202,224 by 2007, a huge jump of 53%! 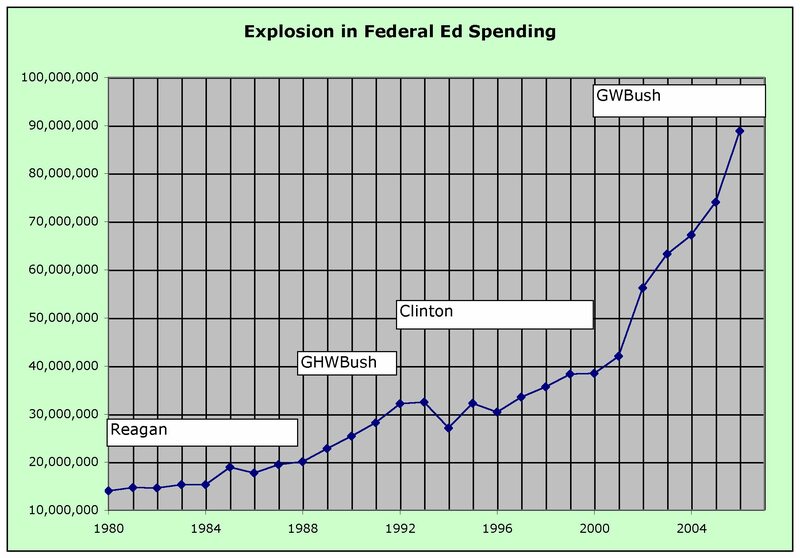 Has this huge increase in federal spending done much good? Read a variety of perspectives about this on our page about No Child Left Behind. Revenues and Expenditures for Public Elementary and Secondary Education, National Center for Education Statistics, U.S. Department of Education. This annual publication is a gold mine of revenue and expenditure data by state for public elementary and secondary education. It contains state-level data on revenues by source and expenditures by function, including expenditures per pupil. 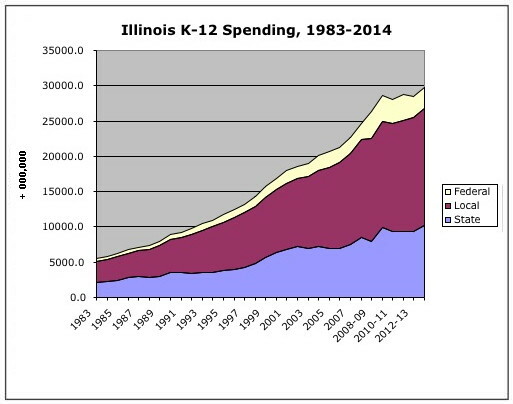 Illinois Schools' Spending Gap No Mystery by Greg McConnell, School Reform News, October 2005. "Periodically ... the media report a story in which the spending gap between the highest- and lowest-spending districts in the state is presented as a meaningful statistic. ... "Unfortunately, the way the education establishment uses this data is often misleading. Moreover, there are factors unique to Illinois that make these spending gaps appear more pronounced than they truly are. ... One of Illinois' unique factors is its 887 school districts. By comparison, Florida has just 67 school districts, even though it has more students. ... Another factor is the cost of living in different parts of Illinois. When an adjustment is made for the cost of living ... [there is] a 25 percent decrease in the spending gap." Salaries for Illinois teachers compared to all workers are better than average: In Illinois, teacher salaries are 31% higher than the typical worker's, a bit better than the national teacher average of being 27% higher. On the other hand, benefits are lower in Illinois: About 21 cents is paid out in benefits per dollar of salary, lower than the national average of 25 cents. Illinois is burdened with administrators, ranking #44 in the nation! Nationally, there are 56 teachers for every administrator, but in Illinois there are only 33 teachers per each administrator. Are Illinois Schools Underfunded? by Lennie Jarratt, Education Matters, May 2, 2006. "total lack of debate about whether there really is a lack of funding"
It's Not "For the Children," It's For the Adults by John Biver, Family Taxpayer Network. "One of the biggest news stories of late has been the funding 'crisis' experienced by Illinois public schools. The single most amazing aspect of this story has been the total lack of debate about whether there really is a lack of funding. Instead of the proper coverage of two or more viewpoints, the news articles typically read much like school district press releases. We're still waiting for some proof to be offered that $20 billion dollars of taxpayer money isn't enough to cover the costs of educating two million Illinois public school students,"
The Public School Money Drain: Chicago Tribune, January 3, 2002. "Too many school districts--including ones that run consistent deficits and borrow from year to year to cover their financial Grand Canyons--are unwilling to change the spending style to which they've become accustomed. They resist adjusting the often extremely generous and comprehensive benefit packages offered to teachers, and are loath to demand more rigorous work schedules or restructured curricula for the higher pay." "Little known to most taxpayers is the financial time bomb ticking in the State run Teacher Retirement System (TRS) fund. In recent years, Illinois has contributed almost $1 billion annually (above and beyond district-level contributions) to curb huge shortfalls in the TRS. Yet despite this huge influx of taxpayer cash, the TRS continues to lose ground. "In 2004, the long-term liability of the TRS hit $46 billion, over twice the total TRS assets! The deficit in the TRS climbed by $3 billion in 2003 alone, even after $930 million in state taxpayer aid! "This should come as no surprise, since many school districts boost salaries just prior to retirement to increase employee retirement income. "Illinois should get out of the teacher retirement business. If school districts drive the TRS into bankruptcy, taxpayers should not be left holding the bag. Why should teachers be granted a retirement benefit so much more generous than that given to the people who pay their salaries?" Deficits Rack School Districts: Expenses Exceed Revenue At Nearly Half Of Them In State, Data Show by Diane Rado, Chicago Tribune, January 2, 2002. Excerpt: "... teacher salaries, pensions and health care costs have continued to rise, often at a rate higher than inflation. Tax opponents and other critics argue that educators have allowed the spending to grow faster than taxpayers can afford. Some say administrators would rather create a crisis to push through new taxes than curtail expenses." Schools Rake In More Than Voters OK by Catherine Edman and Jeffrey Gaunt, Daily Herald, April 10, 2005. "Voters who authorized school tax increases have paid hundreds of dollars more each year than they were led to believe, a Daily Herald analysis shows. A study of 25 tax-rate increases approved by suburban voters during the past five years shows homeowners routinely paid more than most school officials had projected -- as high in one case as $435 a year for the owner of a $300,000 home. That extra comes on top of the hundreds of dollars homeowners already paid after agreeing to a tax increase. ... 'Certain taxing districts reaped a harvest of additional dollars in excess of what the voters approved.' For example, one district the Daily Herald examined -- Libertyville-Vernon Hills High School District 128 -- boosted its operating funds by 85 percent in three years after voters approved a tax increase. ... In all, the 25 districts examined by the Daily Herald collected $204 million more than most school officials would project." True Cost of a School Tax Vote (PDF): "Here are three scenarios (in each of the 25 districts studied by the Daily Herald) showing what the owner of a $300,000 house or business would have paid in property taxes for the school district. 'Extra' is the amount the homeowner paid above what most school district officials would project." Breaking Down School Funding by Jeffrey Gaunt and Catherine Edman. Daily Herald, April 10, 2005 "So you want to know more about school funding? Let's start with the basics. ..."
Law Takes Aim At Tax Loophole by Catherine Edman and Jeffrey Gaunt, Daily Herald, April 11, 2005. "The complicated tax cap law, however, has allowed school districts - and other taxing bodies - to collect millions more than they told voters during referendum campaigns." Daily Herald follow-up: Lawmakers Move Two Bills Aimed At Closing Tax Cap Gap by Jeffrey Gaunt and Catherine Edman. Daily Herald, May 24, 2006. "For years, an unforeseen and costly consequence of the state property tax cap law has quietly chipped away at the bank accounts of suburban taxpayers. The result: Voters have paid millions of dollars more in property taxes than they were led to believe they would before voting on tax-rate increases. That fact, which went largely unnoticed for more than a decade, is now hitting home, as lawmakers scramble to plug the hole, and school officials try to do right by their taxpayers -- or defend previous actions." Eliminate tenure ... If tenure were a good idea, ... plumbers, doctors, accountants, etc. would all have tenure provisions. They don't, because tenure is not a good idea. School choice ... Being able to rescue a child from an underperforming school is a basic right that should not be afforded to the wealthy alone. Family Taxpayer Network comments on "No Taxpayer Left Behind": further analysis of the 6-point NTLB plan. Deficit School Budgets Multiply: Districts' Finances Worry State Panel by Diane Rado, Chicago Tribune, October 17, 2002. "At least 8 of every 10 Illinois school districts expect to spend more money than they take in this year, state officials reported Wednesday, a dramatic increase over previous years and more evidence of what many educators believe is a deepening financial crisis. ED-RED calls itself the "voice of suburban schools" and has a membership consisting of the superintendents of most of the Chicago suburban school districts. Not too surprisingly, they are in favor of loosening achievement goals, giving more money to school districts, weakening tax caps, and keeping as much authority in the hands of district administrators as possible. Nonetheless, they do have some goals that are consistent with those of education reformers: For example, they oppose handing over control of certification to a board dominated by education unions. The ED-RED website is an excellent source of information about current legislation in Springfield, and about our state legislators and the school districts they cover and the committees they are on. Another good source of information about pending legislation in Springfield is this Digest of New School Laws, 2004 provided by the Illinois Association of School Boards. Of course, most of these boards and the IASB itself are highly oriented towards preserving the status quo, so don't expect unbiased coverage. However, this does provide a heads-up. The Illinois Association of School Boards offers this book: "Essentials of Illinois School Finance" by James B. Fritts. The IASB says that this book "provides an effective reference for anyone who needs to understand the essentials of Illinois school finance. From the role of the school board ... to the peculiarities of state funding to the formulas for projecting enrollments and staffing budgets, this book covers just about everything - and does it in plain English. The Second Edition is updated with revised laws and state funding data for fiscal year 2005." We would welcome comments from anyone who has read or used this book. Public School District Enrollment and Spending: Enrollment, per-pupil spending, labor costs and five-year trends for 13,600 public school districts, Education Intelligence Agency. Mechanics of a School District Budget, Illinois State Board of Education. The district budget can be a bewildering stew of tables that fly in the face of conventional accounting procedures and which omit crucial totals. Here's the state's ed bureaucracy's attempt to explain the thing. Illinois School Report Cards: Get your district's current and past state "Report Cards" at this site. You can get your Illinois district's standardized financial profile at the School District Financial Profile page on the Illinois state Board of Ed website. The Illinois State Board of Education (ISBE) provides a website called "ILEARN" (Illinois Local Education Agency Retrieval Network), which provides a wealth of financial information about each individual school district. Chicago Public Schools (CPS) financial information: This is from the CPS itself. "This battle raises the larger question of whether America is failing to sufficiently fund its schools. 'Adequacy' is of course in the eye of the beholder. As a comparative factual matter, however, the United States appears exceptionally generous when it comes to school spending. America will devote more than $550 billion to public schools during the 2006-07 school year, more than $10,000 for every K-12 student. Despite ceaseless claims of tight budgets, after-inflation school spending has more than tripled since 1960. "International comparisons show that U.S. per-pupil spending for elementary and secondary schooling is significantly higher than in other industrial democracies, including those famous for their generous social programs. U.S. spending outstrips Germany, France, and the U.K. by more than 50 percent, and Japan by more than 20 percent, on a per-pupil basis. "Beyond their undemocratic nature and their tendency to aggrandize the role of the courts in social policy, adequacy suits not only waste resources but also create new problems. Adequacy "victories" in states like Maryland and New Jersey appear to have underwritten corruption, waste, and incompetence in public schools. A massive court-mandated program for school construction in New Jersey has been plagued with "pervasive waste and mismanagement" plus bribery, according to the state inspector general. "Experiences like these point to the sad reality that adequacy suits may actually retard school reform -- by distracting attention from real productivity, and focusing on dollars instead of badly needed procedural and structural reforms. Infusions of new money can actually make it easier to shrug off tough decisions on how schools are run, and how educators are paid, evaluated, and hired." Fund The Child -- an Illinois-based website on equitable, student-centered funding for education. Fund the Child: Tackling Inequity and Antiquity in School Finance (PDF), complete report, June 2006. Stopping School Corruption: A Manual for Taxpayers (article), May 17, 2006. "The Yankee Institute for Public Policy outlines strategies to combat corruption in Connecticut's school districts. Stopping School Corruption: A Manual for Taxpayers, by Armand Fusco, Ed.D., is designed to assist Connecticut taxpayers who are seeking responsible answers from districts about whether school resources are being protected from abuse. Fusco's manual lists ten questions school boards should be asked to determine whether school corruption is being committed. Topics covered by the questions include asset management, credit cards, student-activity funds, state/federal grants, contracting, and personnel policies." Stopping School Corruption: A Manual for Taxpayers (PDF booklet), by Armand Fusco, Ed.D. Go to our page on Elections and Referenda.